His most famous work was The English Physician published in 1653, now known as Culpeper’s Herbal. It included an English translation of Latin descriptions by the College of Physicians of various plants and their medical uses, so making herbal remedies more accessible. The rebel herbalist’s life was nothing short of personal tragedy. 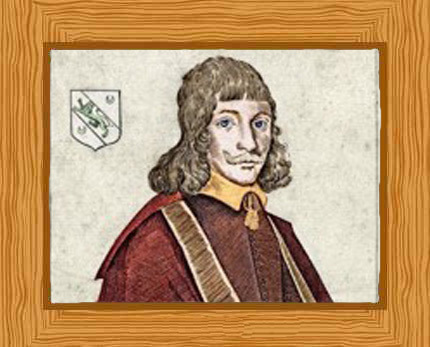 Nicholas Culpeper was born on October 18, 1616, the only son of the young Reverend Nicholas Culpeper, and his wife Mary. The family that he was born into was of aristocratic origins and owned land. At the time, this was a privilege denied to many. His father passed away suddenly just two weeks before he was even born. This was most unfortunate as the young clergyman had only been appointed Lord of Ockley Manor just a few months before. After burying her husband, Mary named her son Nicholas after the father her son never got to meet. She left Ockley Manor, and took the young Nicholas to live with her in her family home in Isfield, Sussex. The fledgling Nicholas was born in a time where medical knowledge was only limited to a privileged few, the licensed physicians. Like most children, Nicholas grew up with a fascination of the wonders of the world. He was influenced by his grandfather, Reverend William Attersole. Being the Minister of St. Margaret’s Church, the old Reverend was a strict and stern man. He was an intellectual, and thus held his grandson’s education of upbringing to be of high regard. Reverend Attersole had high ambitions for the young Nicholas, including sending him to Cambridge, where he had been educated. Attersole was known for being a devout Purist, and had authored a number of many biblical commentaries and theological works. Nicholas learnt to read and write Latin and Greek from his grandfather. At an early age, Nicholas had a fascination with the stars, and read books on astrology in his grandfather’s library from the age of 10. He later discovered William Turner’s “Herbal”. This sparked Nicholas’s interest in medicine, as well as medicinal plants and herbs. He pored over the books in his grandfather’s library for hours on end, until the old Reverend later restricted his grandson’s reading material to the Bible. When Culpeper reached the aged of 16 in 1632, his grandfather sent him to Cambridge University. He was to study Theology, in order to fulfil his grandfather’s dreams of him being a Church Minister, much to his dismay. The young rebel showed no interest in Theology, and instead read the medical works of Hippocrates and Galen. He took out his frustration on his grandfather by drinking and smoking with his peers. Culpeper fell madly in love with heiress Judith Rivers. Knowing their relationship would prove too much of a scandal, with her being born into a rich and powerful family, the two hoped to elope. They devised a plan where they would sail to the Netherlands and settle there. However, this was not meant to be. During their rendezvous at Lewes, his sweetheart’s coach was struck by lightning in a mad twist of fate. She did not survive, and Culpeper was devastated. He later abandoned his studies and became a recluse. His personal tragedies continued. A year later, his mother passed away due to breast cancer, though the gossips would say that she died of shock upon discovering her only son’s affair with the young heiress. This caused Culpeper to refuse to continue his studies at Cambridge. Naturally, his grandfather was disappointed in his grandson and disowned him from the family fortune. Instead, the Reverend used his contacts to set his grandson established with apprenticeship with the Master Apothecary, Daniel White. From then on, he severed all ties with the renegade Culpeper. For five years, Culpeper served as an apprentice. Much of this time was dedicated to cataloguing various medicinal herbs. However, he never lost his fascination with astrology and later admired the works of astrologer William Lilly. A chance meeting with Lilly develop his fascination with the astrologer’s work, and later provided inspiration for the struggling apprentice. Culpeper married 15-year old Alice Field in 1639, who had just very recently come into a considerable inheritance from her wealthy merchant father. Because of this, Culpeper was able to abandon his duties as an indentured apprentice and purchased a home for himself and his wife. He later set up shop in the poorer areas of London. He also set himself up as astrologer, botanist, and physician. This did not set well with the Society of Apothecaries, as they believed that only those who were fully qualified would be worthy to practice the craft. In their eyes, this was complete and utter defiance. Soon, Culpeper had a reputation for being a healer for the poor. He sympathized with them in their plight, because he too had experienced their struggles. He was very active, seeing around 40 patients a day. He charged very little or nothing at all for his services. His grandfather passed away in May 1640. As a final slap to his face, he was left only 40 shillings in the old Reverend’s will. This came to no surprise to him, as Culpeper only viewed his grandfather as a looming authoritarian figure who treated him more like a burden than family. In 1642, English Civil war was upon them. Culpeper responded to the call-to-arms, and wanted to fight in the front lines for the Puritans. However, he was appointed field surgeon because of his medical knowledge. He took only medicinal herbs with him. Soon, he was commissioned to captain his own infantry. One day, during battle he was struck down by a musket shot. Though the Puritans were victorious that day, Culpeper’s days in the battlefield were over. Working amongst the poor in London sparked Culpeper’s belief that medical treatment should not be limited to just the privileged class. This sparked controversy amongst his fellow physicians who regarded him as a traitor who used unorthodox methods in treating his patients. Culpeper translated Pharmacopia Londonesisfrom Latin into English. This was frowned upon by the Royal College of Physicians. Culpeper had the tome published under the name A Physical Directory in 1649. It was his desire to make herbal medicine available to those who needed it the most. The rebel physician later wrote and published many books, which to this day continue to be of use to the medical field. In 1651 he published A Directory for Midwives which complained about the lack of education available to midwives. His most famous work was The English Physician published in 1653, now known as Culpeper’s Herbal. The book included an English translation of Latin descriptions by the College of Physicians of various plants and their medical uses. His health deteriorated due to the wound he received on the battlefield. After a long battle with tuberculosis, Nicholas Culpeper expired on January 10, 1654 aged just 38 years. He left behind his widow, Alice. Though he fathered 7 children with her, only one child named Mary would outlive her father.